VMware Validated Designs provide comprehensive and extensively-tested blueprints to build and operate a Software-Defined Data Center. 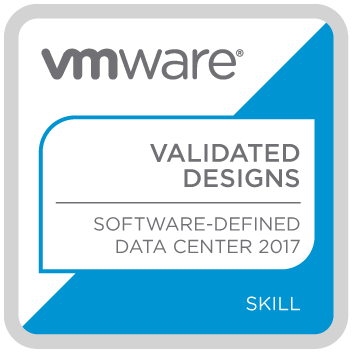 The VMware Validated Designs for SDDC 2017 badge holder is a technical expert that understands the VVD Design Decisions and can successfully deploy and configure the SDDC components to support multiple use cases. Have the VVD Deployment Attestation form completed and signed.